The home of Henry Kollock’s parents was in Elizabeth Town, New Jersey. However, Elizabeth Town was strategically located near Newark Bay and across from Staten Island both of which gave direct access via boat for the British troops occupying Long Island during the American Revolution. Shepard and Susannah Kollock moved to New Providence, about twelve miles to the west of their home, in hopes of greater safety from the enemy. The wisdom of their move was confirmed with skirmishes at Elizabeth Town Point in 1777, and then the burning of their church, the Presbyterian Church, January 25, 1780. Shepard served in the military briefly before he was commissioned a first lieutenant in the Continental Army in January 1777 for a service of two years. During Lieutenant Kollock’s fight for his new country, Henry was born to Susannah in New Providence on December 14, 1778. Following his military service Shepard’s training in printing provided him the opportunity to publish newspapers and books, and as a citizen in his new republic, he was a postmaster, and he worked as a common pleas judge. The Kollock household was a bustling one because Henry was joined by nine siblings, eight of which would survive him. Young Henry was a self-driven student beginning his studies of “the learned languages” with fervor and he showed himself to be a gifted and persistent scholar. He worked hard and long, sometimes so long that his parents had to separate him from his book late in the night so he would get some sleep. Following his formal course of study in the grammar school, at the age of thirteen, he entered the College of New Jersey (Princeton University) with the junior class in November, 1792, during the presidency of John Witherspoon. When he was not fulfilling the requirements for his classes, he was reading on his own in a variety of subjects and delving into other languages. He graduated September, 1794, receiving his Bachelor of Arts before he was sixteen years old. He returned to his family home where he continued his own studies. Shepard and Susannah took their several children to the Presbyterian Church for worship. Henry professed his faith in Christ in 1795 under the influence of his pastor, Rev. David Austin. He was elected a tutor for the College of New Jersey the same year, which was during the presidency of Samuel Stanhope Smith. He performed his teaching duties well and gained a reputation for diligence. One influence of President Smith upon Kollock was the development of an interest in French, which was further encouraged by the recent French Revolution and its kindling in the young American republic an interest in all things Gallic. Henry’s brother, Shepard Kosciusko Kollock, commented that Henry read French as quickly and thoroughly as he did English. As Henry continued tutoring at Princeton in 1797 he also earned the A.M., became convinced of his call to the ministry, and was enrolled a candidate for the gospel ministry under the care of New York Presbytery, which included New Jersey within its bounds. 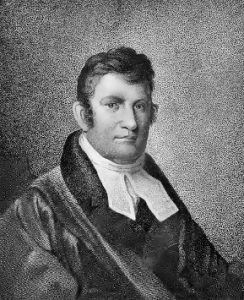 Henry Kollock was licensed to preach the gospel by the Presbytery of New York, May 7, 1800. While he was serving in the college he also ministered by preaching in the afternoon of every Sabbath in the Presbyterian Church in Princeton. Henry’s ability to preach the Bible with clarity and cogency led to his being presented with two calls. One to minister with Dr. Alexander McWhorter of the Presbyterian Church in Newark, and the other to become the pastor of his home church in Elizabeth Town. The two calls were laid before his presbytery during its fall meeting and he accepted the call to his home church. He was ordained just shy of his twenty-second birthday, December 10, 1800, with the sermon delivered by Dr. McWhorter, and the charge to young Kollock was given by his friend, Dr. John Rodgers of New York. Archibald Alexander’s biography, The Life of Archibald Alexander, notes that in 1800 in Princeton “the talk…was about a young man, lately a tutor in the college, whose eloquence was awakening attention. This was the celebrated Henry Kollock” (234). After a few years of preaching and ministry he was appointed Professor of Divinity in the College of New Jersey in 1803 and he returned to Princeton. At the Presbyterian General Assembly in May 1803, Henry Kollock preached the sermon, “Christ Must Increase,” at the appointment of the Standing Committee of Missions. Preaching in an assembly meeting was considered a great honor, but especially so for one who was only twenty-four years of age. One added benefit of the Princeton years was his marriage, June 1, 1804, to Mahetabel, who was the widow of Alexander Campbell, Esq., of Richmond, Virginia, and the daughter of Mr. William Hylton of the island of Jamaica. The Kollocks would have no children of their own, but Mahetabel had children from her first marriage. Still a young man, Rev. Kollock was given the Doctor of Divinity in 1806 by Harvard, and then another was granted the same year by Union College in New York. Things were going well for the young professor and he was becoming more widely known because of his intellectual abilities and skill in preaching. 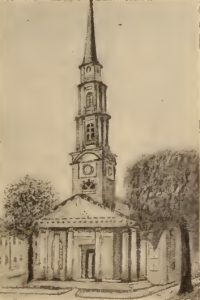 In the summer of 1806, Dr. Kollock was first contacted regarding a call to Independent Presbyterian Church in Savannah, Georgia. After wrestling with the decision to leave his work at Princeton, in the fall 1806, he and Mahetabel packed up and moved the family to Savannah. Dr. Kollock was going to have his work cut out for him because the church was not in great shape physically or with respect to the congregation. As part of his work to order the church he introduced catechetical instruction, started private associations for prayer, he restored “order and discipline in the church,” saw to improvements in the property, and focused the direction of the church’s ministry. In the community, he worked towards the revitalization of Chatham Academy, which had been established in the 1780s but had seen better days. He also proposed the plan and influenced the establishment of the Savannah Public Library. Dr. Kollock’s first summers at Independent were spent in the North of the country to escape the hardships of Savannah at that time of the year. The heat, humidity, water born diseases, and other negative aspects of a Savannah summer were avoided in cooler climates. During the Kollock household’s excursions to New England, Henry often preached as a visiting minister and gave public discourses in churches along his route. In February 1809, the Park Street Congregational Church in Boston, Massachusetts, was founded, and Rev. Kollock was sought to be its minister. Kollock, though not desiring to leave Savannah, visited the church with the idea of accepting the call, but he chose not to when he realized that the church wanted a full frontal polemic assault on Unitarianism, which Kollock refused to do preferring instead to positively preach the Trinity. Other attempts were made to pull Henry Kollock from his Savannah call including in 1810 an offer of the presidency of the University of Georgia. After some summers seeking cooler temperatures, Pastor Kollock decided to remain in Savannah for a summer, then another, until for six summers in a row he stayed in town. Other ministers in town continued their practice of leaving for more temperate zones leaving Kollock the only minister in town, or one of very few. Thus, for six summers in a row he shepherded not only the Independent members who had not left town for milder climates, but also the sheep of other folds that needed care. All of the work and his endless hours of labor contributed to his weakening condition. The year of 1811 was an eventful year for Pastor Kollock. Because of the encouragement of many, he published a book of his sermons. Until that volume, his only published sermon was the one delivered before the General Assembly in 1803 that had been issued in a pamphlet. Also that year, there were earthquakes in Savannah, which turned the minds of some citizens to think of death and eternity. A newspaper reported on December 17, that Savannah suffered four shocks during the last two days with the first occurring between two and three in the morning, followed shortly by the second, then another at 8:00 AM, and the fourth was at one in the afternoon. The quakes affected the southeastern part of the nation with their center in northeast Arkansas and southeast Missouri along the New Madrid Fault. As the unchurched sought help, many entered the seeker-friendly doors of Independent Presbyterian Church where the attendance grew and increased Dr. Kollock’s ministerial load. Alcoholic beverages were commonly consumed in the United States in Dr. Kollock’s day not only socially but also because of impure drinking water, to kill physical pain, and they were believed to have general medicinal properties, “for what ails ya.” From roughly 1790 to 1820, per capita consumption of distilled liquors increased to a rate that was as much as three times what the consumption, circa 2001, was in the United States. Employers sometimes offered mid-day shots of whiskey, in the day often called a dram, to get their employees to show up for work and stay the whole day. Keep in mind that some employees operated machinery such as grist mills or labored in dangerous processes that included mining, refining ore, and casting iron. In places like Savannah or Charleston, with their hot and humid summers combined with improper sanitation, diseases from dirty water were common and drinking alcohol was seen as a convenient preventative. Many in the Christian community were concerned about the problems associated with alcohol abuse, they called it intemperance. The founding father and physician, Benjamin Rush, had written in 1784, The Effects of Ardent Spirits on the Human Body and Mind. He believed that the high consumption of alcohol was troubling for the new nation because voters might cast their ballots in a drunken stupor and the nation would suffer (see, note 6). Churches and denominations were increasingly expressing their views on the subject of alcohol use. The Presbyterian Church General Assembly in 1812 passed a series of resolutions that addressed the growing problem of alcohol abuse (see Appendix for the text of the resolutions). The assembly’s resolutions would come to play a significant part in Henry Kollock’s life. In the day, a gentleman’s home was expected to follow social protocol that often included a sideboard crafted of imported or faux mahogany that displayed crystal decanters containing the finest spirits that could be afforded. 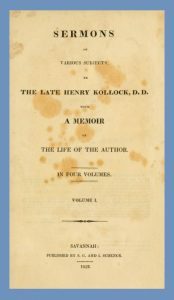 Following the 1812 Presbyterian Church resolutions, Dr. Kollock was approached by some who were concerned that his drinking had become intemperate. 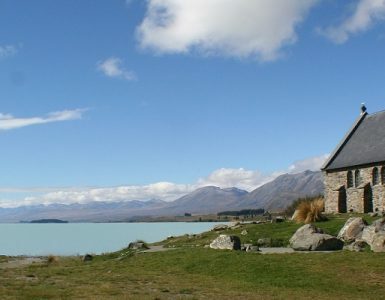 It is not clear whether he really had a problem or not because of the manners of the day that hid embarrassments, but several in his presbytery, Harmony Presbytery, believed there was a problem. A meeting of Harmony Presbytery was called in 1813 as a result of a petition from some presbyters for the purpose of addressing Dr. Kollock’s situation. Action was tabled until testimony was gathered and Dr. Kollock was called to attend the next stated meeting of Harmony Presbytery. One thing led to another, Dr. Kollock resigned from the presbytery and then did not show up as he had been called. Presbytery suspended him but he refused to recognize the discipline because he believed he was not under the presbytery’s authority any longer, Independent Church was very disturbed over the whole issue, and Kollock ended up greatly disheartened by the whole event and believed he had been betrayed by his fellow presbyters. Eventually, Harmony Presbytery communicated with the 1816 General Assembly regarding whether Dr. Kollock should be restored to the ministry to which it responded with an extended resolution calling for patience in resolving the situation (see Appendix for assembly’s resolution). Thus, one of the factors that contributed to Independent Presbyterian Church’s decision to continue to be independent, as it is currently, was the situation with Dr. Kollock and Harmony Presbytery. James Stacy commented in his account of the case that, “In reviewing the case we can see errors and mistakes committed on both sides. Dr. Kollock erred in resisting the authority of the Presbytery to which he had promised obedience, and furthermore in not confessing his sin and asking forgiveness and restoration. Had he done this his brethren doubtless would most gladly have forgiven and restored him…” (309-310). It is unfortunate that the events occurred, but the failure to resolve the situation with Harmony Presbytery left Dr. Kollock’s intemperance, if he was in fact intemperate, unclarified and unresolved. Dr. Kollock continued his ministry at Independent with his health suffering due to his busy schedule. He wanted to take a break from the church and rest. Off and on, he had been working on a life of Calvin but had exhausted the resources available to him in the States. He sailed for Europe in March 1817, leaving his brother, Rev. Shepard K. Kollock, to supply his pulpit. After a thirty-two day sea voyage he arrived in Liverpool, from which he visited the chief cities of England, Scotland, Ireland, and France. In London and Liverpool, he preached to large congregations. He was gone about eight months with his feet returning to walk the docks of Savannah on Monday, November 3. However, even though he had achieved some rest and relaxation, he had not obtained the Calvin material which had been part of the purpose of the trip. Thus, his Calvin book project went uncompleted and unpublished. Independent Presbyterian Church grew greatly during Dr. Kollock’s ministry and it became necessary to build a new church building. It was dedicated May 9, 1819, Dr. Kollock delivered his sermon from Haggai 2:7, which was the same text his friend John Rodgers had preached when his Rutgers Street Church and Brick Church buildings were dedicated in New York. Present at the dedication of this building on Sunday, May 9, 1819, was John C. Calhoun, President James Monroe, and members of his cabinet. The summer and fall of 1819 was a time of particular sickness and death in Savannah. Kollock labored long and hard to help those requiring ministry which led to increasing breathing problems and heart arrhythmia. He commented to a friend that he felt worn out. On December 13, he preached a sermon on the Good Samaritan for the orphans in the Union Society. Thoroughly weakened and declining daily, he remained in his bed. At one point, he requested to have a selection from Pilgrim’s Progress read to him. He died Dec. 19, 1819, just five days after his forty-first birthday. He is currently buried in the Laurel Grove Cemetery with Mahetabel who joined him in 1833 (see note 5). Sources—The main source is the memoir of Dr. Kollock’s life in vol. 1 of his sermons, pages xi-xlviii, which was written by his brother, Shepard. The sources concerning Dr. Kollock’s case with Harmony Presbytery are, James Stacy, A History of the Presbyterian Church in Georgia, no publisher and no date but after 1912, pages 305-312, and George Howe, vol. 2 of his, A History of the Presbyterian Church in South Carolina, 1883, pages 233-243. The news report of the Savannah earthquakes of 1811 is from, http://andspeakingofwhich.blogspot.com/2014/02/the-mississippi-earthquake-of-1931.html. Also, David Calhoun’s, Splendor of Grace: Independent Presbyterian Church, 1755-1905, Greenville: A Press, 2005, was referred to for information. Notes—(1) For a biography of Dr. John Rodgers on Presbyterians of the Past, click HERE. (2) In 1823, Shepard K. Kollock, Henry’s brother, was offered a call to Independent Church but he declined and continued his work as a professor in the University of North Carolina. (3) The salary which Independent first gave Kollock was 3000 dollars, then a parsonage was added later, and then in 1818 his salary was increased to 4000 dollars. For comparison, Archibald Alexander’s starting salary as the first professor of Princeton Seminary in 1812 was 1800.00. (4) Henry Kollock’s pastor in Elizabeth Town, David Austin, left the PCUSA in 1797 and became an increasingly controversial minister involved in eschatological speculation and millennial fervor. In 1794, Dr. Kollock’s father published David Austin’s book, coedited with John Sutcliff of Olney, England, The Millennium; Or, the Thousand Years of Prosperity, Promised to the Church of God, in the Old Testament and in the New, Shortly to Commence, and to be Carried to Perfection, Under the Auspices of HIM, Who, in the VISION, was Presented to St. John. The book included a work by Joseph Bellamy and another by Jonathan Edwards, but it was concluded with an entry by Austin titled, The Downfall of Mystical Babylon; or, A Key to the Providence of God, in the Political Operations of 1793-4. (5) It was said that the Kollocks are “currently” buried in Laurel Grove Cemetery because according to their entry on find-a-grave, they were originally buried in the South Broad Street Cemetery but were reinterred by the trustees of Independent Church, April 15, 1886. (6) Henry’s father, Shepard Kollock, 1750-1839, and his brother Shepard Kosciusko Kollock, 1795-1865, are sometimes confused in the sources. Those in the know distinguish Henry’s brother with his “K” middle initial, but it is important to keep their vital dates in mind and be careful with the sources. (6) The information on Dr. Rush was found in Sarah W. Tracy’s entry, “Alcohol and Alcohol Abuse,” in The Oxford Companion to United States History, ed. Paul S. Boyer, 2001; I have found this book to be very helpful for introducing subjects and providing basic information for writing. (7) “Elizabeth Town” is also spelled “Elizabethtown,” but is known currently as Elizabeth, New Jersey. The following report from the General Assembly of the PCUSA for 1812 is from pages 511-512 of Minutes of the General Assembly of the Presbyterian Church in the United States of America From its Organization, A.D. 1789 to A.D. 1820 Inclusive, Philadelphia: Presbyterian Board of Publication, . The 1812 assembly was lengthy, May 21 through June 2; considerable work was accomplished regarding the founding of Princeton Seminary including election of its board of directors and selection of Archibald Alexander as its professor; and the times were volatile because near the end of its meetings on June 1, President James Madison’s call for a declaration of war against Britain was approved after heated debate and the War of 1812 officially began. Resolved, that it be recommended to all the ministers of the Presbyterian Church in the United States to deliver public discourses, as often as circumstances may render it expedient, on the sin and mischiefs of intemperate drinking; in which, as well as on other suitable occasions, both public and private, it will be proper pointedly and solemnly to warn their hearers, and especially members of the church, not only against actual intemperance, but against all those habits and indulgences which may have a tendency to produce it. 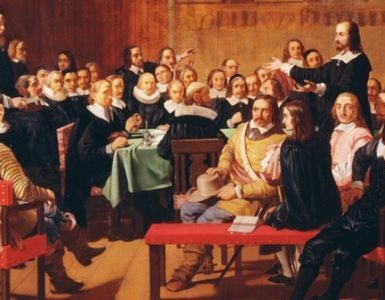 That it be enjoined on all church sessions within the bounds of the General Assembly, that they exercise a special vigilance and care over the conduct of all persons in the communion of their respective churches, with regard to this sin, and that they sedulously endeavor by private warning and remonstrance, and by such public censures, as different cases may require, to purge the church of a sin so enormous in its mischiefs, and so disgraceful to the Christian name. That it be recommended to the ministers and other officers and members of our church, that they exert themselves to diffuse as extensively as possible, among their congregations and the community at large, such addresses, sermons, tracts, or other printed compositions on this subject, as may have a tendency to produce a suitable impression against the use of ardent spirits, and to recommend sobriety and temperance. That it be recommended to the officers and members of our church, to take such measures as may be judged proper and effectual, for reducing the number of taverns and other places of vending liquors by small measure, in all those parts of our country in which either their excessive numbers, or the improper character of such places, render them a public nuisance. 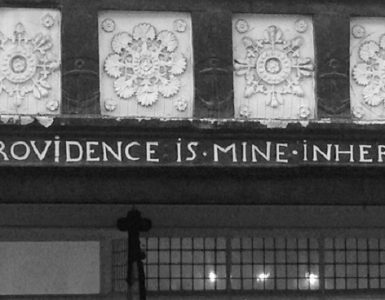 It is believed that the evils arising from these sources are incalculably great, and that by prudent management, they admit, under providence, of very considerable diminution. The following is the full text of the PCUSA General Assembly’s decision in 1816 regarding Henry Kollock and Harmony Presbytery with the advice of the assembly to the presbytery. The General Assembly sympathize with you in the painful business detailed to them, and lament the unpleasant events which have taken place relative to Dr. Kollock. And it would afford the Assembly no small degree of pleasure fully to comply with the request of the Presbytery, and in such manner as to remove their difficulties, and heal the wounds which have been inflicted. It will be admitted by all, that the decisions of the Assembly should be marked with correctness and wisdom; and it will be as generally admitted, that it is highly needful to enable them to do this, that they have a correct and clear view of the cases or facts on which they are to decide. The Presbytery of Harmony request the Assembly to examine their conduct, and to censure or support them, as they shall appear to have done right or wrong. The Assembly are ready to do this, and it is believed, will cheerfully do it, so soon as the records of the Presbytery of Harmony which relate to this subject, shall be fully before them. In the mean time, it is with pleasure that the Assembly reflect that the Presbytery of Harmony, by carrying this subject to the Synod of which they are a constituent part, may probably obtain a more speedy relief than they could receive in the event of waiting for the decision of the next General Assembly. Rev. Brethren, we pray that you may have direction from above, and all prosperity in the Lord.